There is nothing new in this short article but it may stir a few practical ideas. My efforts are all about minimum weight since I need to get it on a plane. I have quite a few roach poles but only take one on my foreign jaunts. Antenna for restricted space; also an invisible antenna. Voor de 40 meterband heb ik een 21meter lange antenne gemaakt die op een isolator staat. Deze antenne wordt gevoed door een 600 ohm lijn van 10 meter lengte, in principe is het een zepp. die vertikaal staat. The EA5AVL 40M Compact 4-Square Antenna was designed to provide excellent DX communications on the 40m band, utilising readily available components and be relatively easy to construct. This antenna requires a good earthing system. Twelve 4m wires were buried in the lawn by using a spade to create a slit to drop the wire into. Later an additional 10m surface wire was added to bring the SWR down to 1.25:1 reading. During the PACC contest in 2009 we missed a good performing antenna for 40m. 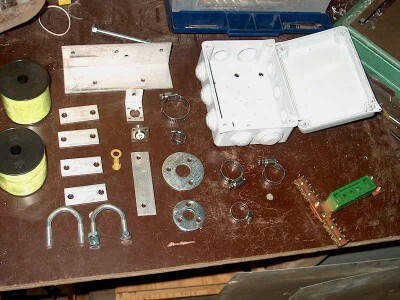 So during the preparation for this contest in 2010 I built a dedicated vertical for 40m. I have always admired the Butternut vertical antennae. They are very well built, using good quality "doorknob" capacitors, and nice airwound low-loss coils. Having had an "HF2" for a while, I decided to see if I could make a homebrew "improved"..?? version. 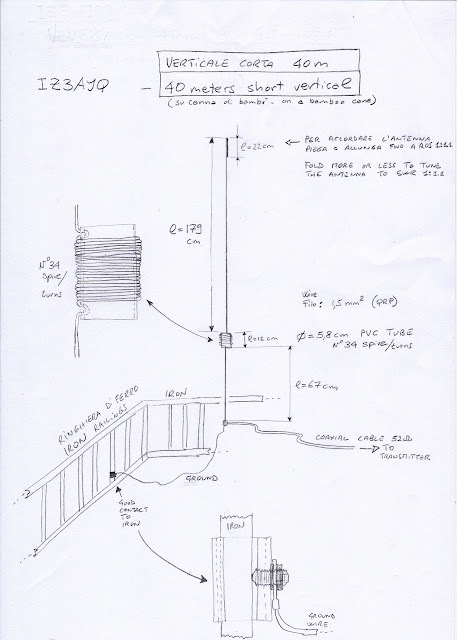 I wanted a high efficiency 40 meter antenna with a low-angle radiation pattern for working DX. A vertical antenna seemed the obvious solution because verticals are low-angle radiators. 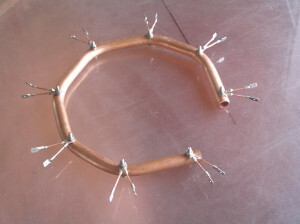 To construct the antenna, I used 6 tubes of each 2m length. Starting at 10mm diameter for the top and ending with 36 mm at the foot. To assemble the rods I made a cut in the top of each tube. This shortened easy-to-build vertical, with no-radials, is made from surplus military camouflage poles. It has gain and wave angle comparable to a full-sized ¼λ ground plane antenna with radials. Decide where the vertical will be located and plant the first metallic post in the earth. Insert the PVC insulator on top of the post. 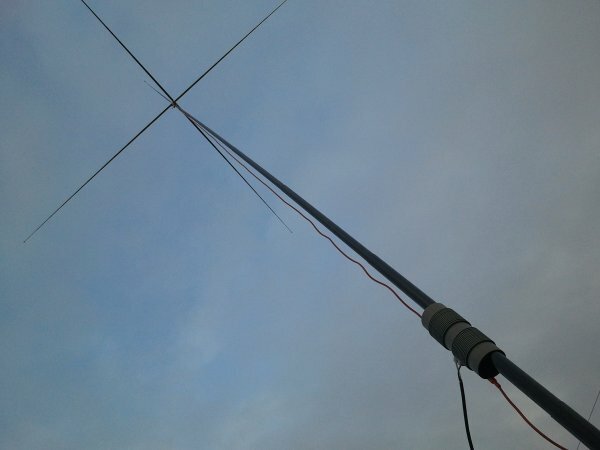 This 40 meter Inverted V antenna was tested and tuned at a height of 35 feet and proved excellent results. A distance of approximately 80 feet is required to tie off the ends of the antenna. The ends of the antenna are about 11 feet above the ground. In 2006 I operated on 40m with a vertical antenna for a while. The lower end was about 2m above ground and the top of the antenna reached a little over 12m. This gave me a full size antenna for the 40m band. An advertisement for the i-Pole by Proantennas on the WIMO Homepage made me curious and I decided to give that antenna system a try too. My primary interest was a lightweight portable vertical antenna for 40m, as for 20m - 10m I use my C-Poles.